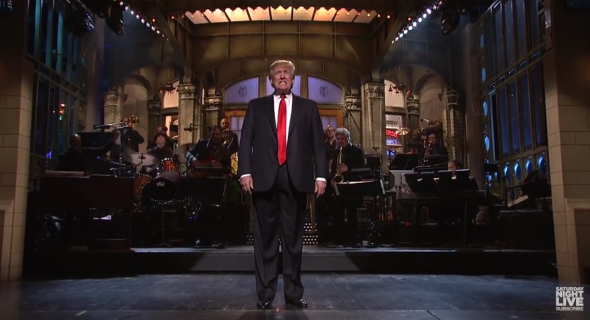 NBC Offers GOP candidates equal airtime after Trump’s SNL hosting gig. Trump’s 12 minutes of fame. A comedy sketch show like ‘SNL’ doesn’t obviously fall into any one of those groups. The FCC has never released an official opinion on whether the law applies to shows like ‘SNL,’ but NBC has assumed it does… The FCC rule lets qualified candidates get comparable air time on the same network in the same time slot. There’s no right to appear on the same show, so candidates couldn’t demand an “SNL” cameo of their own… The free air time is generally restricted to broadcast markets in places where candidates have been actively campaigning. Trump’s 12 minutes and 5 seconds doesn’t seem like all that much airtime for a host of an hour-and-a-half variety show, but that’s another matter. When Hillary Clinton made a 3-plus minute appearance on the show earlier this year, NBC affiliates posted the same offer to her democratic competitors. And even that wasn’t NBC’s first equal-time rodeo. “After Al Sharpton hosted the NBC variety show in 2003, the campaign of Joseph Lieberman, a rival for the Democratic nomination, requested equal time,” Variety notes. “That led to an agreement in which some NBC stations aired footage of a Lieberman campaign event.” And everyone knows a Joe Lieberman-hosted campaign event circa 2003 was approximately as entertaining television as Saturday Night Live.